About a week ago I noticed some black crud on the comb of one of our ISA browns. At first it just looked like some dirt, but then I saw it the next day and the next. I’ve read that people new to chicken keeping can get caught up in the excitement and novelty of their flock and overlook the health of the birds. I’ve been trying to avoid that mistake by routinely checking each bird and noting any apparent changes. After doing some online research and finding photographic examples of different diseases, I went out this morning to photograph the sick chicken for comparison. 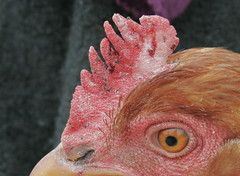 The black crud went away and now there are small white lesions on both sides of her comb. This tells me that she has fowl pox, a very common viral infection in poultry around the world. 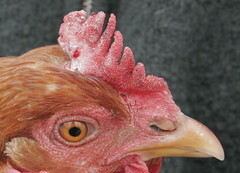 From what I’ve read online there is no treatment for fowl pox and it usually runs its course in 3-5 weeks. [USDA info page] I’m going to make a call into the local Extensions office on Monday to seek advice and see if she should be quarantined form the rest of the flock. My inclination is yes, but I don’t where we’d put her at this point. Prevention through vaccination seems to be the only way to deal with fowl pox, which makes me wonder which if any of our birds were vaccinated.